It's unlikely to change your life but if you’re anything like me reading Viktor Frankl’s Man’s Search For Meaning will prompt you to think deeply on the most serious issues of human existence – love, suffering, and the importance of meaning. 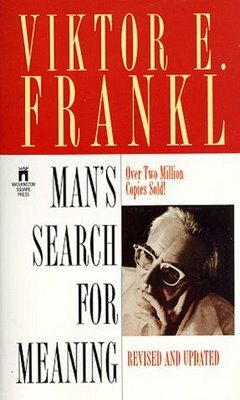 The last of these Frankl considered a more relevant drive in shaping human behaviour than pleasure or power as espoused by his Austrian predecessors Freud and Adler respectively. Frankl – who died at the age of 92 in 1997 – was an existential psychotherapist and therefore concerned with treating psychiatric patients. To that end he founded the school of Logotherapy, which flourishes today. Frankl was developing his theories on the importance of meaning when his beliefs were put to the test in the direst circumstances. He survived the horror of three years in concentration camps including Auschwitz from 1942 until the end of the Second World War. As Jews his family were transported from Vienna in cattle trucks to the camps. Frankl lost his parents, pregnant wife, and brother in the Holocaust. His book Man’s Search For Meaning dates from 1946. The first half of the slim volume is truly remarkable. Frankl recorded his Experiences in a Concentration Camp. Set against the starvation and punishment he examines the mental state of the inmates, the SS guards, and the equally brutal Capos, prisoners who acted as trustees. The second half of the book - Logotherapy in a Nutshell - is studded with insight. A lack of meaning in life is the main cause of anxiety. Meaning is different for everyone and isn’t static. A man shouldn’t ask what the meaning of his life is but rather it is he who is asked by life – and he can only answer by taking responsible action. "We can discover this meaning in life in three different ways,” said Frankl: (1) by creating a work or doing a deed; (2) by experiencing something or encountering someone; and (3) by the attitude we take toward unavoidable suffering. Happiness cannot be a goal in itself but attends meaningfulness. But happiness isn’t everything. For example, we do a disservice to the incurable sufferer who is made to feel guilty by their unhappiness when they should be allowed, if they wish, to be ennobled by the fortitude with which they meet their illness. Man’s Search For Meaning has sold many millions of copies. I can't explain why I haven't come across it sooner but I'm glad I have. Yes Frankl, at that time was amongst that cream of gifted liberal intellectual, generally assimilated Austrian/Viennese Jewry which contributed so much to ideas and the arts during the 19 th and 20 th centuries until the Nazi scourge slaughtered and scattered them.[Jaffa]. Was your copy new or secondhand, GC ?